ALPS Technologies, Inc. is a premier countertop fabricator of Granite, Solid Surface, Quartz and other engineered and natural stone materials. From product selection to installation, our strength is our ability to handle multiple-sized and styled projects in a timely and efficient manner, while maintaining a high level of product quality. 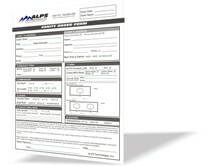 ALPS has recently introduced a vanity program developed to help our customers looking to price vanity applications to their clients. The program allows them to easily quote traditional sized vanities off of a price list for those sizes and comes with an order form (Click Here). Vanity Sizes Include: (up to) 25" - 31" - 37" - 43" - 49" - 61" - 72"
The pricing in this program includes; edging, undermount cut-outs, and backsplashes with the option of side splashes. Additional options include pick-up or delivery and includes the majority of our brand categories. Interested? - Call 732-764-0777 ext 19 for more details.